Every year on the second Saturday in September a number of people support us raising funds by taking part in the Historic Churches Trust sponsored Bike Ride. Others help out by being in church signing the papers of those cycling from church to church. Thank you to all those who sponsored our cyclists last September. Many people are involved in helping out behind the scenes. We are grateful to everyone delivering the Church Magazine once a month and to those who lend a hand with special events, setting up the gazebo and by baking and cooking. The flowers in our church contribute a great deal to the welcoming atmosphere in St Andrew’s. 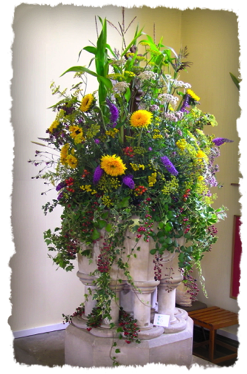 People of all faiths and none, experienced flower arrangers as well as those needing a hand, are involved with arranging the flowers. If you would like to be involved, Jem (780459) is only too willing to help you on your way. * By setting up a Standing Order with your bank – if you would like details on how to do this and on church bank account numbers, or a Standing Order form then please contact our treasurer through our contact page. If you are a UK taxpayer (Income or Capital Gains Tax) and would like the church to be able to claim back the basic rate tax through the government’s Gift Aid scheme, you will need to fill in, sign and return to us an ongoing Gift Aid declaration if you have not done so already. St Andrew’s can recover the basic rate of income tax, currently 25p for each pound given, at no extra cost to you. Download your Gift Aid form here.